As someone who feels deeply the consequence & wildness & force of words, I never thought I’d settle on words I’d want on me for the rest of my ever. But while re-reading one of my favorite books (which is equal parts lyric, elegy, & theory), Roland Barthes’s A Lover’s Discourse: Fragments, I stumbled on this shiver of a phrase that seemed to already belong to my body. The actual fragment is "Mais j'écris a la place une lettre d’amour." The translation: "But instead I write a love letter." If ever I had a personal ethos it is this: Mais j'écris a la place une lettre d'amour. Mais j'écris a la place une lettre d'amour. ["Against and in spite of everything"] . . . mais j'écris a la place une lettre d’amour. For fellow typeface nerds, I went with Edwardian Script (designed in 1994 by Edward Benguiat & influenced by the look of writing with a steel pointed pen). I got this done this past summer while living in Madrid by Sonia at Acme Tattoo (Calle del Canal del Bósforo, 2, 28022), a wonderful artist at a wonderful studio. foretold me, I am a net of nerves hung out into the abyss. to themselves. You fear the volition of your hands, their famine. oil silking across the surfaces of each other’s pond-like joints. behind the city amid the corn we touch until we feel like receipts. into charcoal between us, a Rorschach no one dares to interpret. has delivered us here? What beautiful jinx? dawn lonsinger is the author of Whelm (winner of the 2012 Idaho Prize in Poetry and Freund Prize), and recipient of a Fulbright Fellowship, four Dorothy Sargent Rosenberg Prizes, the 2014 Greg Grummer Poetry Prize, and runner up for the Poetry Society of America’s Emily Dickinson Award. Her poems and lyric essays have appeared in American Poetry Review, Black Warrior Review, Colorado Review, Subtropics, Best New Poets 2010, and elsewhere. Her poem, “Sundress,” was recently chosen by the Pennsylvania Center for the Book to be featured in their Public Poetry Project 2016, and will appear on 1500 posters that will be distributed to Pennsylvania libraries, public schools, bookstores, and universities. She holds an MFA from Cornell University, a PhD from the University of Utah, and is an Assistant Professor at Muhlenberg College, teaching Creative Writing, Poetry & Politics, and Monstrosity & Apocalypse in Literature and Film. You can learn more about lonsinger’s work at www.dawnlonsinger.com. These days, she is beguiled by the unsheepish, the benevolent, the feral, the quiet, the ghosts, and the storms. 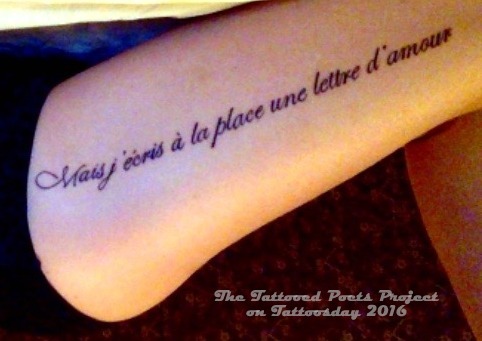 Thanks to dawn for returning to The Tattooed Poets Project and sharing a new tattoo and poem with Tattoosday readers!